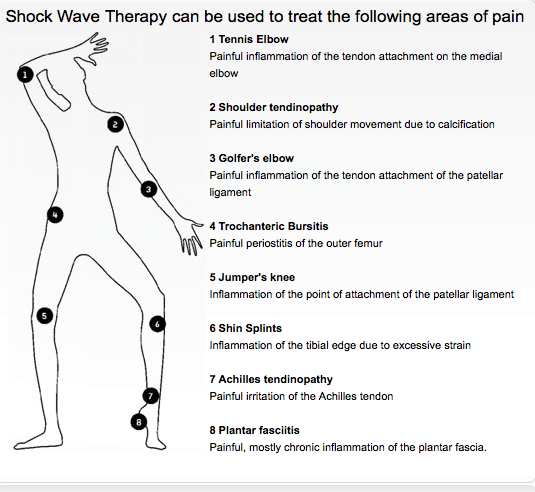 Shockwave treatment is a clinically proven treatment for soft tissue injuries. A shockwave is defined as a sound wave that passes through the body and is not an electrical pulse. Treatment initiates a pro flamatory response in the tissue where the shockwaves have been applied. The body responds by increasing the blood circulation and metabolism in the impact area, which in turn accelerates the body’s own healing processes. The shockwaves break down injured tissue and calcifications.